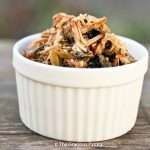 This clean eating slow cooker pork & kale takes about 5 minutes to prep! Just when I was thinking about packing away my slow cooker for the season, mother nature blasts us with a week long downpour of slow cooker weather. But I won’t complain since this delicious dinner was the result. I find myself not eating a lot of meat right now. I just don’t want it or crave it. But when I cook it in a slow cooker, it’s a completely different story. It’s just so good and moist and shreddable! I love shreddable meat. There’s just something about the texture that really does it for me. And while I know some of you don’t feel that pork fits in with a clean eating diet, for those of you that do eat pork, this one is completely delicious! Just please know that you should always purchase the best quality pork you can afford. Standard pork these days is pretty nasty stuff. So if there is one place to spend more money, the pork department would be a good bet. An easy, delicious slow cooker dinner that takes only minutes to prep! Place everything in your slow cooker, pork chops on the bottom layer and tomatoes on the top layer. Please note that the nutrition data is a ballpark figure. Exact data is not possible. This recipe sounds great. Just curious if you need to add the diced tomatoes for the recipe to be good. I don’t really like tomatoes and usually substitute for tomato sauce when I can. Sbroverman – You have to have something acidic in a slow cooker to tenderize the meat, or you’ll end up with rubber. If you can think of something else that is acidic to sub with, feel free. Otherwise, you do really need the tomatoes. Sophie – That’s wonderful! You can’t get much more nutritious than kale! KimH – Yes, thank you. My web designer is working on it. I hope to have it fixed by next week. Heather – My pleasure! Enjoy! deborah – I hope you enjoy it! Farmerswife – I would opt for chicken on this one. I made this recipe 2 days ago and I absolutely love it. Thank you for sharing this with me. 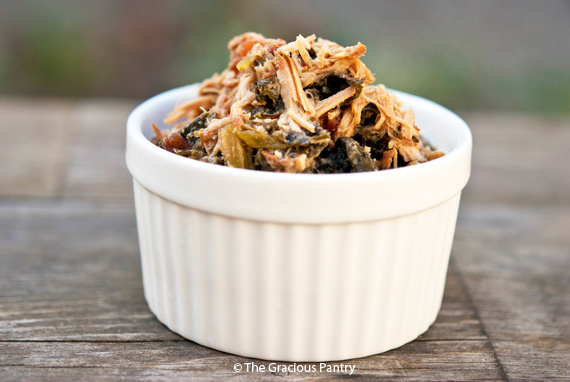 It’s a great way to incorporate more kale into my meals and it makes pork taste so amazing. Great job! I can’t see what you come up with next. Rachel – I’m so happy you enjoyed it! Kelly – There are lots of things you can do with kale. Treat it like spinach and make whatever you like. It’s good stuff! You need the sauce to tenderize the meat. Plain tomatoes won’t do that. Try making some sauce first and then doing this. It’s the only thing I can think of. Which brand of tomatoes do you use? I can’t find ones with no sugar added. Thanks so much! I get mine at trader joes. It’s their brand. But you can always just dice up some raw tomatoes. Not quite the same, but close enough. Sure! The texture will be slightly different, but still good. Can I cook it on high to reduce the cooking time? Probably. But be sure to use a meat thermometer to be sure the meat is fully cooked. I made this recipe yesterday. Cooked it on low for an hour and then high for 4 hours and then again on low again for an hour and a half. The result was… well… it smelled really good but the taste was not adequate. Also, pork and kale were floating in juice from the canned diced tomatoes and it looked far from appetizing. I did follow all the proportions, perhaps the cooking time or the slow cooker itself was the cause? It was my first experience using slow cooker so… any feedback is greatly appreciated. Thanks! I’m not sure why you would change the settings like that. Was there a reason you did that? You have to understand that a slow cooker cooks at the same temperature on both high and low settings. The difference is in how long it takes to arrive at that temperature. I could be wrong, but I’m pretty certain it was the change in settings. Once you set a slow cooker to cook, you want to leave it alone. Changing settings will only cause problems. All I have is a pork tenderloin, would that work too? You might have to adjust the cooking times, but it would probably work. Maybe if you slice it up? That’s what I’m thinking, I’ll try it and post how it turns out, thanks! By the way, slow cookers generally come with two settings: low setting is actually 200F and ‘high’ is 300 F. Both of these temperatures are suitable for cooking raw meat when cooked for the length of time the recipe recommends. Will give your recipe another try but without any interference this time! Interesting. The Crock-Pot® web site says they both cook at the same temp. Maybe I read it wrong. I’ll have to look again. After trying this I now use it as my basic slow cooker recipe base. Particularly those last four ingredients. I just use whatever meat I have in the freezer, and usually frozen veggies. It’s such an easy and cheap meal. It also makes the house smell amazing when I get home from work. What do you serve with this? I’d like to try this but I’m not sure what will be good with it or how to make a meal of it. This was a complete meal for us, but you could always serve some rice or quinoa as well. Maybe a green salad if you want more veggies. do you leave the bone in the pork chops , or cut them off? Julie – I don’t use chops with bone, but once they are cooked, the meat should just slide right off the bone. Do you happen to know how many pork chops is 2.5 pounds? We purchased them at Costco and have already divided them up (2 in a bag) to freeze…thanks! Excited to try this! Gretchen – It’s approximately 5 chops. But it will depend greatly on their size. It’s best to weigh them. Made this with collard greens and threw in organic all natural salsa. Delicious!! First let me say…I love your website. So many amazing recipes to choose from and NO GUILT! That said, this was not my favorite. I felt it was too bland, for my taste anyway. I tried adding a fancy pepper and some salt. It was better but still was lacking in flavor. One reader suggested adding salsa. I gave it a shot and it helped tremendously. I think I would try this again, but skip the tomatoes and just go with a 1/2 jar of clean salsa. Just my 2 cents. Thanks! Keep them coming!! Thank you the great recipes! My mom used to make a ground (run through a grinder) kale main dish, with a pork roast cooked in it until the pork fell off the bone. It was cooked on top of the stove(before there were slow cookers) for hours on low. She was German. Do you know of any german recipes that prepare and cook kale with pork this way? Art – Not that I know of, but I can certainly research it. I love this recipe and so does my family! I love all your recipes! I just bought and received your freezer meals book and can’t wait to make some this weekend. Thank you for all you do! You’ve really helped me learn how to cook clean for my family. Courtney – I know people who have done it, but I can’t recommend it because of food safety issues.